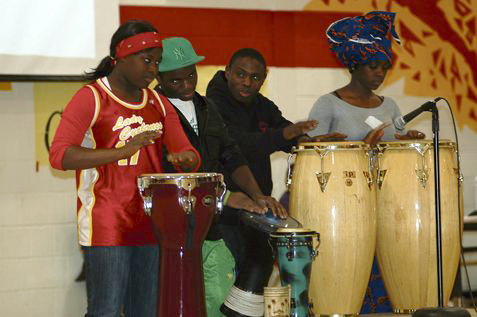 A drum performance began the celebrations at the Cultural Fair at Central Collegiate. More than 21 countries were represented at the second annual Cultural Fair at Central Collegiate on Wednesday. Students were able to give people a taste of their cultures through performance, presentations as well as food. The event was hosted by the school with the Moose Jaw Multicultural Settlement Workers in Schools Program. Countries represented include Libya, Eritrea, Kosovo, Thailand, Nigeria, Guinea, Cote D’Ivoire, Sudan, Philippines, Ethiopia and Sierra Leone. Michelle Smith, who runs the English as an additional language (EAL) program at Central Collegiate, said the event gives students an opportunity to share the cultures that are at the school and also in Moose Jaw. “We are hoping to raise awareness and sensitivity within the city to all these various cultures,” she said. “We have 21 different booths here so 21 counties are represented and that’s not everybody (at the school).